I’ve been thinking about the different, though parallel issues with power abuse in teaching in both music and movement, specifically yoga. We have more and more people coming forward with experiences of sexual abuse in both arenas, and it makes me wonder, how did we bestow so much authority to our teachers? How did we end up trusting them implicitly, and sometimes blindly? Cults isolate members from their families, jobs, lives, etc. Cult leaders are masters of manipulation and mind control: their tactics may include public humiliation and fear based language. Leaders may also proclaim magical abilities and assert absolute authority. Of course, there are many other aspects to cult, often based around spiritual practices, money, and more, and you may be wondering what this has to do with anything. At some point in the last few years, I realized that certain teachers have aspects of these cultish behavioral traits, and inflict harm upon their students. This can take the form of older yoga teachers who made sexual passes at their students, or whose “adjustments” took the form of groping, but it can also include the private instructor at a college who mocks their students for their failures, publicly humiliates their students in group settings, and tells their students that they are the only good teacher out there. While I’ve had some amazing private instructors over the years, I’ve seen this behavior, and only experienced it a few times. -I briefly studied with an instructor that asked for blind allegiance, that I only studied with her, and only played the repertoire, etudes, and scales she assigned, nothing else. She also told me that other string teachers weren’t as good as she was, and that she ALONE could lead me to success. She also said I had to go to the summer festivals that she taught at, or else I couldn’t study with her anymore. Now, there are some good reasons to ask for a student to stay on track with their assignments, repertoire, and technique, but denying the validity of all other teachers was a red flag for me. I was a teenager at the time, but I decided this wasn’t a healthy relationship and I started seeking help elsewhere, and eventually switched instructors and schools. The instructor also humiliated me in front of a studio class, claiming that I shouldn't have done well in the school concerto competition, and that someone else should’ve won. (I placed third). It’s only been as an adult that I’ve realized that this same power oriented behavior shows up in so many different aspects of life: politics, teaching, work, and relationships. In the yoga and meditation community, there have been notable “guru” figures who have fallen from grace- once venerated, now revealed to have abused their power for personal gain, or even worse, using that power to try to leverage for sexual favors, money, and more amongst their followers. A great podcast on Bikram Choudhury’s rise and fall shows some of these power dynamics- self asserted proclamations of magical healing, complete devotion from followers, denial of other yoga practices, abuse of power, and more. Yet, Bikram is not alone. Similar issues have come up in the ashtanga community with Pattabhi Jois, in the formerly Anusura community, in the Shambala Buddhist meditation space, and more. Many keen minds have looked at this pattern of pseudo spirituality and cult behavior, and written about their findings, yet what I find most compelling is the pattern that moves beyond the yoga and meditation space. Where do these tactics show up in our daily lives? What political leaders try to use these same approaches to gain loyalty and support? How do music instructors use some of these tactics as well? Let’s look at college music instruction, both at the undergrad and graduate levels. Students have most likely selected the college based on the teacher, his or her reputation, and the track record of students before them. There may be an implicit or explicit promise of “Study with me, and you’ll win a job.” There may be an implicit or explicit promise of “this is the best way because it worked for me.” There may also be a denial of other approaches, other performers’ validity, and refusal to allow for cross pollination- this was my biggest red flag as a teenager. If a teacher or performer will listen to no other musician but him or herself, there’s a problem. If a teacher denies all other teacher’s validity, that’s also a problem. When we put our private instructors on a very high pedestal, it opens the doorway to abuse of power, which could be purely professional or sexual abuse. How do we move forward? As adults, we have the power to question the methods of our teachers and do better. We have the power to not recommend known abusers to students seeking instruction. We have the power to promote many methods and a positive learning environment for students. And as a youngish adult with many colleagues in music and music instruction, we have the potential to create a better teaching environment for decades to come. Common sense will tell you that musicians (and athletes, dancers, or anyone who focuses on one human activity the majority of the time) will experience muscle imbalances at some point in their life or career. They might not label their pain or adaptation as a result of muscle imbalances, but it's often at the root of our issues. Let's backtrack first though. I sort of love this picture focusing on the more aesthetic side of muscle imbalances- most imbalances won't be this obvious! Image from Pole PT. Muscles move bones through a combination of contraction and relaxation in tandem with opposing muscle groups (i.e. the hamstring group and the quadriceps group or opposing groups). Contraction is also called facilitation, and relaxation as inhibition. In the gait cycle, the hamstrings will contract to extend the hip and flex the knee, whereas the quadriceps will contract to extend the knee and flex the hip. They work in opposition at various points in walking. (*Just to be clear, there are many other myofascial units that play a role in gait. This is just a simplified example!) Normal muscle function is when the facilitation/inhibition cycle is balanced, with no one muscle or muscle group dominating above the others. Imbalance is when a muscle or muscle group dominates within its role in movement. This may be due to overtraining, meaning that the opposite muscle may be weak, with limited range of motion, or have difficulty firing. If we apply this to walking with hamstrings and quadriceps, many people over-fire their quadriceps, meaning that they don't relax after their work is done. This may then pull on the knee cap (patella), affect the resting length of the hamstrings, and also affect movement actions like walking, extending the hip, etc. This uneven relationship may be because of overtraining (i.e., way too much quadricep strengthening, lack of hamstring mobility or strength) or a combination of other factors. 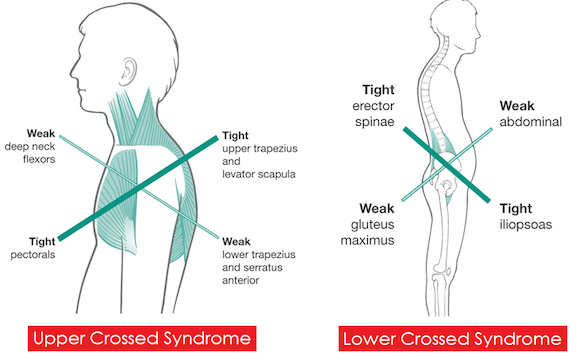 One of the common theories to address imbalances is upper/lower crossed syndrome. This simplified chart demonstrates muscles that are weak, which may be inhibited, and muscles that are tight and perhaps overly dominant or overly developed. I would also suggest that the words weak vs. tight are not the best to describe the syndromes, because some muscles are weak and "long resting length" and some are weak and "short resting length." There's more to it than just weak=long and strong=short. This is still a muscle theory, which means that there are mixed feelings about whether these relationships are accurate! Although this is still a theoretical model, many musicians do have many of these symptoms, including forward head posture, and overly kyphotic/rounded upper spine, and weakness in the back body. What makes this issue more interesting, at least to me, is that it's not just a muscle issue. Our nervous system plays a huge role in the way we recruit muscles and retrain them. For example, a trauma to the tissues (accident, injury, etc) can affect the muscles long after the injury has passed. Speaking from personal experience, I injured my knee in a bike accident 8 years ago, but my non injured hip and leg do weird compensations, even though the other leg is perfectly capable of healthy movement now. Physical and emotional trauma can also take on an emotional/fear response- a past injury or emotionally traumatic event may evoke a sense of fear, albeit unconscious, when addressing that muscle. Musicians who have experienced tendonitis in one arm or hand may have this sense when beginning to rehab, practicing a challenging passage, or receiving massage/bodywork. This can also apply to more complex traumatic events like assault, physical violence, car accidents, and other events, which may force the person to dissociate from their body or areas of the body. All of this can be labeled as a neuromuscular imbalance, which is more complex than simple "muscle weakness/strength" models. 2) Daily movement and lifestyle choices: This can include sitting posture, shoe choices, standing posture, sedentarism, how one holds one's case, cell phone, or belongings, and so forth. 5) Illnesses: arthritis, diabetes, chronic fatigue, and many other illnesses affect muscle tension relationships, pain, and strength. 6) Pain: Pain will affect the nervous system's ability to know where it is in space (proprioception) and will affect movement. There have been quite a few good blogs on pain and movement, so here is one from guest writer, PT Arlyn Thobaben, to get started. 7) Stress: Stress, along with pain, can affect muscle tensional relationships. Often when we're stressed, we move and breathe in a less than optimal way, which may enhance tension in the upper back, neck, and so forth. How can we address these issues? Bodywork, especially with someone who can address muscle imbalances and nervous system imbalances can be a great starting point. General exercise can make imbalances worse if not addressed- seeking a knowledgeable trainer in pilates, corrective exercise, weight training, or other movement modalities can help restore balance to overworked muscles. As I mentioned in the last post, everything starts with awareness, so finding a teacher in subtle body practices like Alexander Technique, Body Mapping, Feldenkrais, or other practices can be very helpful in feeling the imbalances in your own body. Lastly, giving your nervous system the chance to relax, whether through constructive rest, massage, or meditation is a great starting point for moving out of the fight and flight sympathetic nervous system response.